A timeless shoe, originating over 500 years ago, the brogue is full of history and style. Once a very basic shoe, intended for long walks across bogs and muddy terrain, the brogue’s sole purpose now is fashion. Men’s shoes can often be un-inspiring, but recent years have seen a rising trend in fashionable men’s footwear. Designers globally have ditched all preconceived gender stereotypes and redefined our views on ‘masculinity’. With such luxurious shoes, you may find yourself struggling to style an equally fashionable outfit, but look no further. Brogues are a more than suitable option for a day at work. For a classic look I would suggest that you opt for some polished black brogues, paired with a slim-fit deep charcoal grey suit and a crisp white oxford shirt. Complete with a couple of simple black accessories such as a black belt and tie, plus a silver watch. For a quick drink at a bar after work in the summer you could remove the tie, undo the top two buttons and throw on some silver aviator sunglasses! 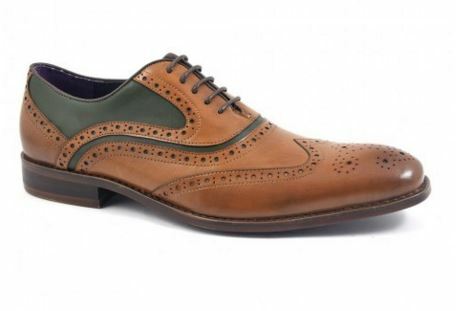 If you’re going for a more alternative look then get yourself some brown vintage inspired brogues. You could wear these with either a slim-fit navy suit or a woollen plaid suit with a burgundy roll neck jumper, a brown belt and a vintage pocket square of a complimentary colour. If you feel like adding something else to finish the look, then try a pair of tortoise shell wayfarer style sunglasses. As for a more day-to-day casual affair, I would opt for a burgundy red pair of patent brogues, grey socks in an oatmeal colour with a pair of indigo blue denim jeans in a slim fit. Match the jeans with a smart fit jacket, (I know what you’re thinking, but trust me on this one…) under the jacket wear a roll neck top which matches the oatmeal colour of the socks which will be peeping out under the turn ups on the jeans and wear a deep green tweed waist coat buttoned up between the layers. To fully complete this look throw on a beige mac coat, turn up the collar on both that and the denim jacket. Et voila! Your casual look avec brogues is complete and street style ready. If that all sounds like a bunch of jargon to you pair your brogues again with a pair of slim fit, indigo blue jeans turned up, a dark grey t-shirt, a statement camel coat and a tartan scarf hung around your neck loosely. This look is just as street style ready, yet has a lot more wearability with ease! Whether you prefer a simple and clean cut look, or something a bit more alternative, brogues will keep your feet looking dapper for every occasion.